I have been too busy lately to blog because for this month I am teaching at Benares Hindu University two college classes a day, four times a week. Today we had off from teaching because it is the anniversary of the school’s founding in 1916 on the auspicious day of Saraswati day. On this day, also called Saraswati Puja, Hindus worship their devi Saraswati, the goddess of knowledge, music, art and culture. Students, educational institutions seek the blessings of mother goddess so that they can attain enlightenment through knowledge in their chosen field. Originally, I was going to write about my teaching but in this day dedicated to education, the knowledge of women’s ritual education was discussed. There is a Sanskrit college for girls in Varanasi founded in 1971 to give women access to the sacred texts but it seems they developed in their ideas and now for the last eight years have been giving full training to be Hindu Brahmin Temple officiating clergy. Their training last for ten years to be as rigorous as any men’s program. They enter the program of study around the ages of 9-11 and finish a decade later with a BA or MA. They get up at 4 AM and keep the full monastic Brahmin life of prayer, meditation, sacrifice and training in ritual as well as a full secular studies curriculum. They have little or no contact with the outside world, no radio, no TV, no movie night. They wanted to create a program as intense as the best of the men’s programs. They follow all the strict Brahmin Orthodox rules and they live as a right leaning Orthodoxy. To add to this, they also study archery, swords, daggers, javeline, and horse riding similar to the martial arts monks. But in the last five years, they have started to advocate the adoption of traditionally male prayer rituals, especially the wearing of the sacred thread, it is like a talit worn by all Orthodox male Brahmins to show their status.It it given at at imitation ceremony similar to bar-mizvah. It was always a male ritual garment and now the women are starting to wear them. The arguments are familiar ones:Can a women keep her body clean? What of her childrearing role? Were there women in history who wore them? What did the original text say? For thousands of years, religious decree barred women from entering temples and chanting or listening to mantras. The law was scripted by Manu… A strict section of the Brahminical order interpreted Manusmriti, the laws of Manu, as gospel. They quote Manu to provide credence to their claim: “For women, no sacramental rite is performed with sacred texts. Women destitute of strength and knowledge of the Vedas are as impure as falsehood itself” and that “there is no ritual for Vedic verses for women”. Some even equate women with shudras, the lowest in the Hindu caste hierarchy, and say that molten lead should be poured into women”s ears should they hear the Vedas. All that has been turned on its head at Shri Jigyasu Smarak Panini Kanya Mahavidyalaya, a Sanskrit college for girls in Varanasi. Manu”s 5,000-yearold law is being challenged here, where almost a hundred girls sit down to perform havans [fire offerings] while chanting Vedic hymns every morning. The college is a unique centre of Sanskrit teaching exclusively for girls where they are taught to practice all the 16 sanskaras (sanctifying or purificatory rites). “Some pundits had cleverly crafted “stri-suradau nadhi yatam, iti shruti” (it”s said that women and Sudras can”t recite and listen to Vedas) and inserted it in holy scriptures,” says Acharya Nandita Shastri, a senior teacher at the college. The school was founded in 1971 by Sanskrit scholar, Acharya Dr Pranja Devi, and his sister Medha Devi, the current principal. It started as a pathshala (primary school) with just four students in a small house. Their efforts to change the way the scriptures are interpreted have been praised by Brahmins themselves. Professor Somnath Tripathi, who teaches ancient history at Varanasi”s Sampurnananda Sanskrit University which conducts the examinations of the college, rejects the belief that only male Brahmins have the right to recite mantras. What the scriptures preached was yagna and jajman, one who pays for religious services to a priest or a Brahmin. Also, the concept of karmakanda (religious rites) was non-existent in ancient writings. “Since Sanskrit was in the hands of Brahmins, they followed Manusmriti and imposed it on others as they deemed fit. Besides, with the emergence of shankaracharyas, Manusmriti was strengthened and karmakanda was institutionalised in the 9th and 10th centuries,” says Tripathi. The girl students are often called to perform Hindu religious rites ranging from karmakanda, antyeshti (funeral), vivah (wedding), shanti yagna (for peace), grih pravesh (entering a new home) and naamkaran (naming ceremony for a child). They are also leading a quiet movement to perform upnayam (sacred thread ceremony) for women as per ancient practices. In today”s times, only Brahmins can conduct such a ceremony. “The institution has so far produced about 25 women scholars, at least 12 of whom are engaged as priests in Hyderabad. They perform pujas at community events and at home,” says Nandanam Satyam Arya, the coordinator. The institute was set up by Acharya Prajnadevi, who rebelled against the Brahminical order that denied women the wisdom of the Vedas. She vowed to follow the paths of ancient women scholars like Gargi and Maitrayee. But grooming priests isn’t the only objective. “It’s not our goal only to produce women priests. Imparting a thorough knowledge of the Vedas and Sanskrit shlokas is important, too. But it’s the women who want to be priests. And, we find nothing wrong with it,” Arya says. Kaumandi, Tejaswini’s classmate from Nepal, already has her own take on what it takes to be a Brahmin. “Brahmins aren’t just born, they are made, too.” Her teacher, Suryadevi Chaturveda, smiles approvingly. “She’s right. Brahmins have to learn and grow in a proper culture to be known as one,” says the 40-year-old. Predictably, Panini Mahavidyalaya’s efforts have raised the hackles of conservative Brahmin leaders. Batuknath Prasad Shastri, a senior priest at Viswanath Temple, has written to teachers at the institute saying Hinduism doesn’t permit women to wear the holy thread, recite shlokas, pronounce Om and perform yoga. And, in no way does it allow them to become priests. “It is not wise to let women work as priests for they have handicaps in carrying out pujas,” Shastri argued. The response, some made through journals, has been more than quick. “We have sent Shastri rejoinders, which have been printed in a Sanskrit magazine. We have told him that if women have some handicaps, so do men. They also fall ill and might become impure not to be able to perform puja,” Suryadevi said. Panini Kanya Mahavidyalaya is a boarding Sanskrit school for girls, mostly from upper bramin class. Education is free but donations are welcomed. There are about 80 girls from the age of 8 till 20 live and study at this school. The school is categorised as a Gurukula type where students live under the instructions and care of a Guru as the centre of the community, doing concentrated study for years and form a particular school of thought, but historically and corresponding to the level of education it received the name ‘Mahavidyalaya’ which is equivalent to college. Students receive titles of ‘shastry’ and ‘acharya’ after completing their education and are allowed to pass the exams and have official diplomas from Sampurnand Sanskrit University in Varanasi. Thus, on the one hand, this gurukula follows tradition, that is rules and injunctions of traditional Brahmanical education, but those were meant for men only, so on the other hand, it is almost a revolutionary step towards education and empowerment of women. 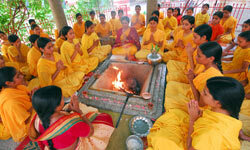 Girls here learn to perform vedic fire ritual as well as traditional sixteen Hindu sanskar (initiations) and even more interestingly, they are allowed to perform the sanskars for other bramins. Still it remains fascinating how the ides are practically realized in real life and what is the future of the schools of this type? 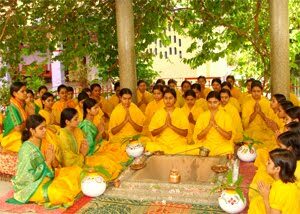 There are few schools which provide high quality Sanskrit education for women. It seems to remain an ambitious experiment but a successful one. Archery, swords, daggers, javeline, lathi, horse riding girls of this Gurukul have kept alive the ancient methods of war games and at the same time are overshadowing modern world with their self defence skills that also includes karate and martial arts. Dharmavati Arya, a student, has won accolades in the field of archery. Her calm nature and depth of knowledge in her eyes do not give even a clue that this young girl has mastered archery at national level. She was recently invited by Tata Archery Academy, Jamshedpur, for advanced training in the sport at international level. “I can hit the object with my arrow by looking at the object in the mirror (this act was practiced by Arjun of Mahabharat),” says 22-year-old Dharmavati. “Girls here do not panic while walking alone on roads and when trapped in problematic situations. Instead, they fight hard and emerge victorious.I believe it is very important to have these skills in this times when we do not know who might turn out to be our enemy,” added Priti.